We are happy to be writing this blog back aboard Idyll Time. It was a good three week 3200 mile trip across the U.S. in the RV. A few days were spent in Colorado near Grand Junction exploring some of the smaller towns and wineries. 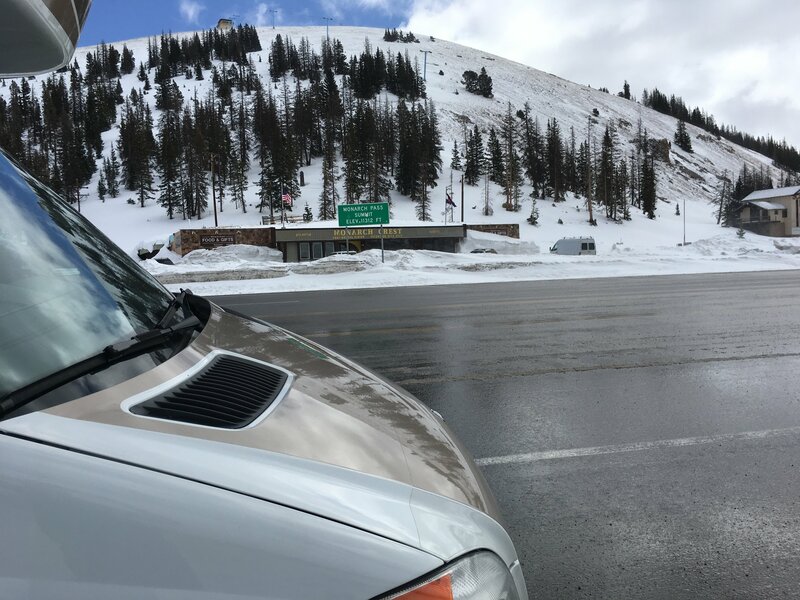 The only snow we saw was atop Monarch Pass in which we climbed up to 11,000 feet before dropping down into Utah. The RV handled the climbs with ease. It’s Susie who gets extremely nervous going down the long mountain passes. The scenery was beautiful but extremely dry through Kansas, Colorado,Utah, Idaho, and western Oregon. These areas did not get much snow over the winter. The drought for us ended in Portland,Oregon. There we had three days of steady rain. This did not detour us from exploring the city. Their public transit makes getting around very easy. From our campground outside of the city we were able to take the local buss to the train station. There we took the train into the downtown city center. A $5 unlimited day pass allowed us to ride the buss, train, and street cars. A highlight was a three hour walking food tour. Our guide took us to six different restaurants where we sampled various dishes and deserts while gaining an education on the food culture and history of Portland. 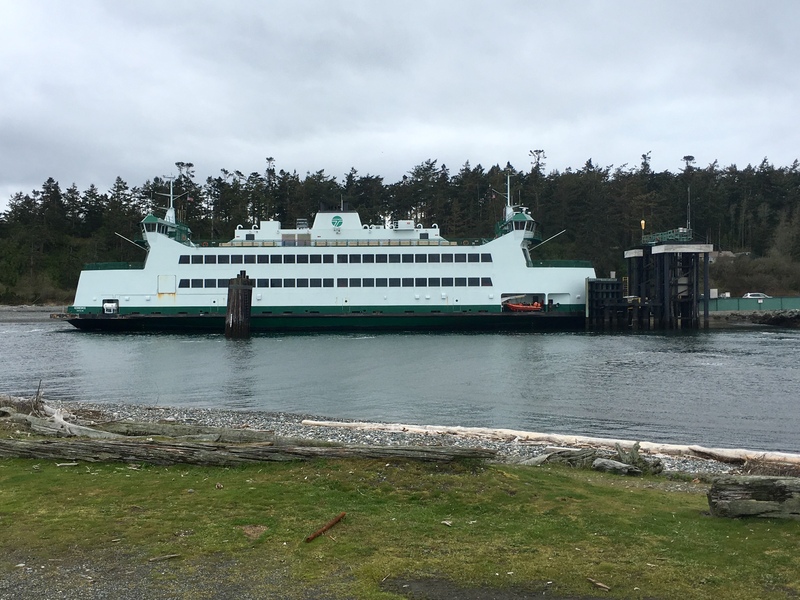 We made a Sunday morning run from Portland to Anacortes, WA by the way of the Olympic Peninsula and Washington State ferry. This allowed us to bypass the traffic and congestion of Seattle. 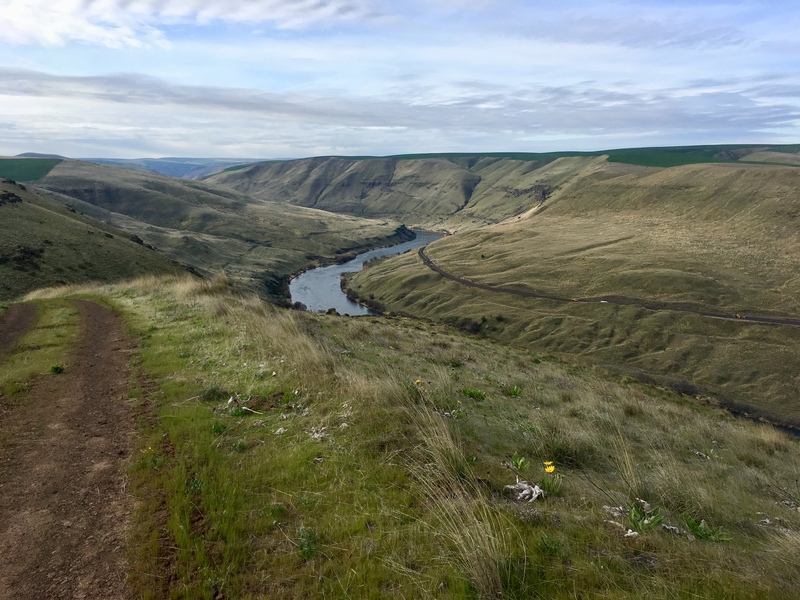 Our next stop was Blaine, WA where we had an appointment with US Fish and Wildlife to stamp Nate and Primo’s CITIES permit so they could leave the U.S. Within just a few minutes we crossed into Canada where we had to get the Canadian Customs to stamp the bird’s CITIES passport into Canada. Being the second year, we now know the procedure for getting the birds in and out of Canada. We are still trying to find a way to get them into Alaska later this year. USDA is making this very difficult. A ride on the massive BC ferry from Vancouver brought us to Vancouver Island. 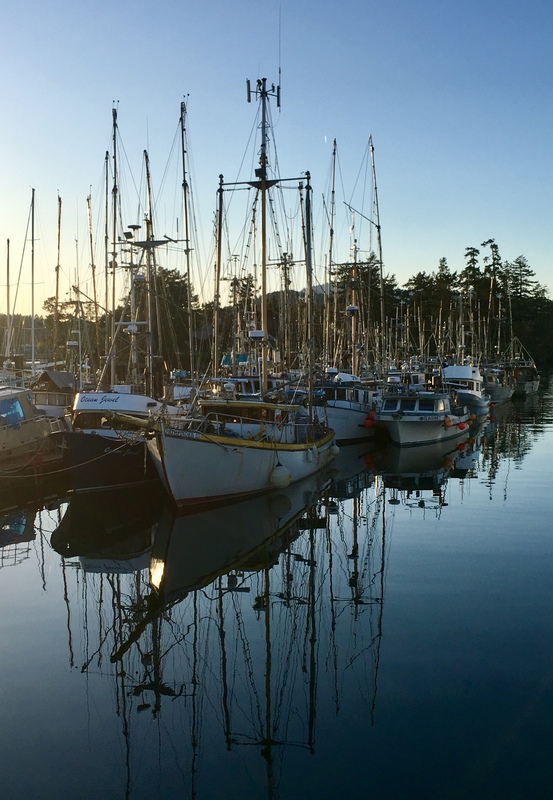 From there it is just a short drive to Sidney and Van Isle Marina where Idyll Time has been spending the winter. It’s hard to believe that it has been almost seven months since we hauled Idyll Time and said our goodbyes for the winter. This is the longest time that we have ever been away from her. We were very pleased with how good she looks. Philbrooks did a great job of taking care of her over the winter. We had a survey of the boat done last fall as the boat is now 12 years old and a survey had never been done. 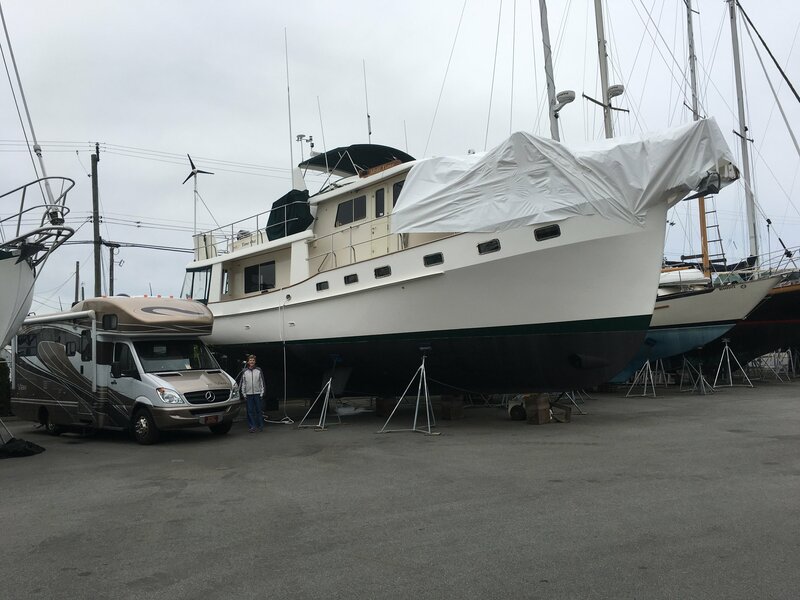 Although she came through with an almost clean bill of health, the surveyor did find a few items that needed attention some of which were already on our extensive work list for Philbrooks to complete over the winter. Hydraulic hoses were replaced, a new engine water pump was installed, a new generator exhaust elbow for the bulkhead was made as the stainless steel elbow had a pinhole leak, a house battery bank cutoff was installed, stabilizer rod ends and bushings were replaced, along with new bottom paint on the hull and a new main rudder seal. Our new hot water tank developed a leak and was replaced under warranty. Lastly, the hull was waxed before setting her back in the water. Lots of $$ later, the girl looks good. 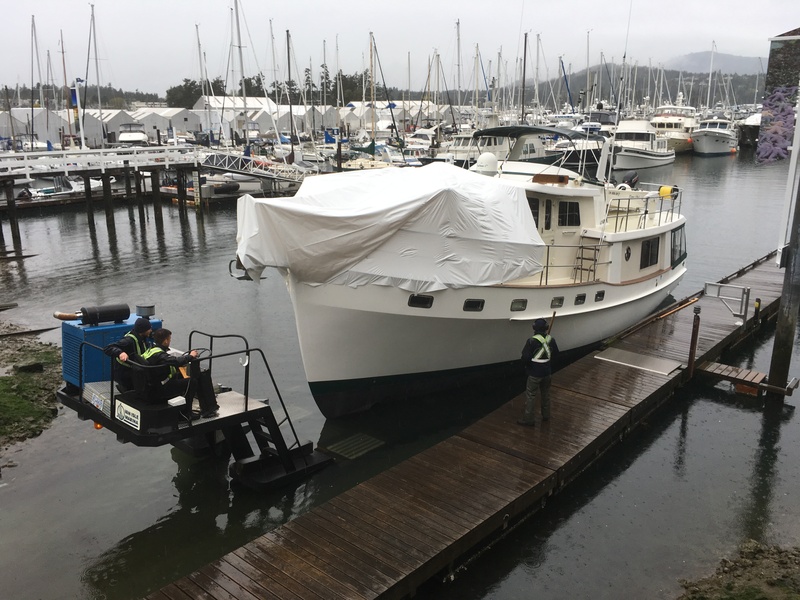 Van Isle Marina positions their hydraulic lift gently under our hull and transports Idyll Time across the street and down the steep ramp where she is once again set afloat. We are now rafted to some other boats on Philbrook’s dock for a week or so while some final work is done. The white tarp is so the gel coat cracks and varnish can proceed in the rain. There has been no drought in Sidney. This was one of the rainiest winters they have seen. Luckily, the forecast for the next two weeks has very little rain. Maybe spring has finally arrived and we can get underway soon. So, what are our cruising plans for 2018? We will spend a few weeks exploring the Gulf Islands. Victoria and Butchart Gardens are two popular stops we will make while spending some time with family. We hope to start trekking north around the middle of May. Our goal is to reach Glacier Bay in Alaska before turning around and heading back to Sidney. It is about 3000 Miles roundtrip which is a lot of miles to cover over four months in a boat that cruses about 8 mph. Nothing is set in stone. We will just see how far we get. There is lots of fishing and exploring to do between here and Alaska. This entry was posted on April 20, 2018 at 8:48 pm. You can follow any responses to this entry through the RSS 2.0 feed. You can leave a response, or trackback from your own site.